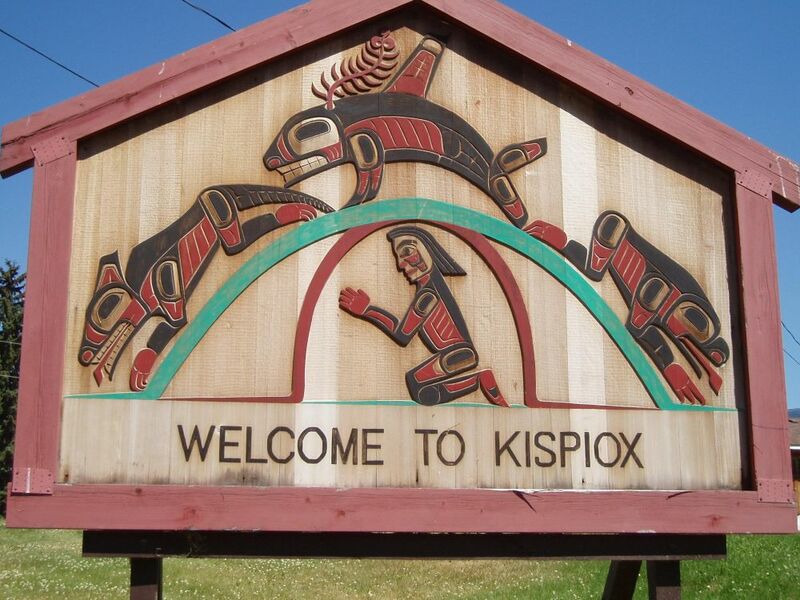 The 'Welcome To Kispiox' sign was commissioned by the Kispiox Band Council from world-renown Master Gitksan Artist, Walter E. Harris, O.C. The photograph was taken by Ian Murphy. Anspayaxw translates to "People of the Hiding Place", the community of Kispiox is one of six ancient Gitksan communities which exist today in the area. Kispiox is estimated to be about 3,000 years old, having existed, like several other villages, since the time the population was dispersed from the ancient city of Txemlax’amid by a disaster. Archaeological and oral history evidence indicate that the Gitksan occupied the valley of the Ksan or Skeena River following the last ice age about 10,000 years ago. Villages have been found and abandoned throughout Gitksan history. The last two villages to relocate were Kuldo’o and Gisga’g’as; they moved to Kispiox and Gitanmaax. Today there are 7 First Nation communities within Gitksan territory. Kispiox has a total membership of 1,555 members as of May 2011 – 607 reside on reserve and 948 members reside off reserve. The total population for Kispiox which includes our members, other band members, non-registered and non-native residents is approximately 744 as of December 2010. Kispiox Band is governed by an elected body consisting of nine Councillors and one Chief Councillor. The Kispiox Band Office staff consists of fifteen permanent full time employees, two machine operators, casual labourers and seasonal silviculture crews. In the last ten years Kispiox has continually seen growth in population and services provided to our membership. One of the main tourist attractions along the Skeena River is our Totem Poles. There are approximately twenty-four Hereditary Poles that belong to different House/families. Our community is comprised of three main Clans, they are Giskaast, Lax See’l and Lax Gibuu . There are fifty Hereditary Chiefs within our community of which Hereditary Chief Geel is the Head Chief. This photograph to the right is of our beautiful and majestic totem poles located at the confluence of the Kispiox and Skeena Rivers. This picture was taken in the early morning by a local photographer, Mike Weeber. "Kispiox is a community of healthy children, youth, adults, Elders and families that succeed in our Gitksan way of life."